Tribu Yaqui in meeting. Photo: Flickr user Malova Gobernador. Used under CC 2.0 license. A new pipeline under construction in northern Mexico has become a major controversy involving the local Yaqui indigenous community that is less than pleased about the pipeline’s route. The Agua Prieta pipeline would go straight through Yaqui territory. Things went from bad to worse on Oct. 21, when the pipeline’s supporters attacked a group of protesters, killing one, wounding eight, and causing no small amount of property damage. The Yaqui tribe, which has endured a long history of repression, also has a history of mounting various resistance movements. Like other indigenous communities in Mexico, members of the Yaqui tribe have lost their lives fighting against invasive private companies and non-indigenous authorities. Just two years ago, before the conflict over the Agua Prieta pipeline, the Yaquis protested against a large-scale aqueduct that would have diverted what was left of their sacred river to the city of Hermosillo. According to design specs, the Agua Prieta pipeline project would begin in Arizona, in the United States, and lead all the way to Sonora, Mexico. Along the way, the pipeline would cross 90 kilometers of Yaqui territory, which is protected by Mexican law. Building the pipeline without consultations that are deemed to be fair, transparent, and inclusive for all of the Yaqui communities would be a violation of the sovereignty of Yaqui land, community leaders say. On one hand, the Yaquis of Loma de Bácum oppose the pipeline and have legally filed an appeal against the work. Thus far, the project has been carried out beneath a simulated consultation of SENER (Secretariat of Energy) Them, together with the company Sempra Energy, the government of Hermosillo, the local media, and the municipal governments (all of which have supported the work) have sought by any means necessary to debilitate the opposition of Loma Bácum. Women from the Yaqui community (who requested anonymity for security purposes) reported that the construction of the pipeline, run by Gasoducto Aguaprieta, has generated violence ranging from clashes between members of the community, to threats against Yaquis leaders and women from the same ethnic group, and human rights defenders of indigenous peoples and environmental activists. They explained that, as a result of the conflict, cars have been ignited, and there have been fights that even killed a man. Some women in the community have had to stay in places they consider safe, since that was what Yaquis authorities of the town of Bácum recommended. They have received threats because they opposed signing the collective permit for the construction of the pipeline. 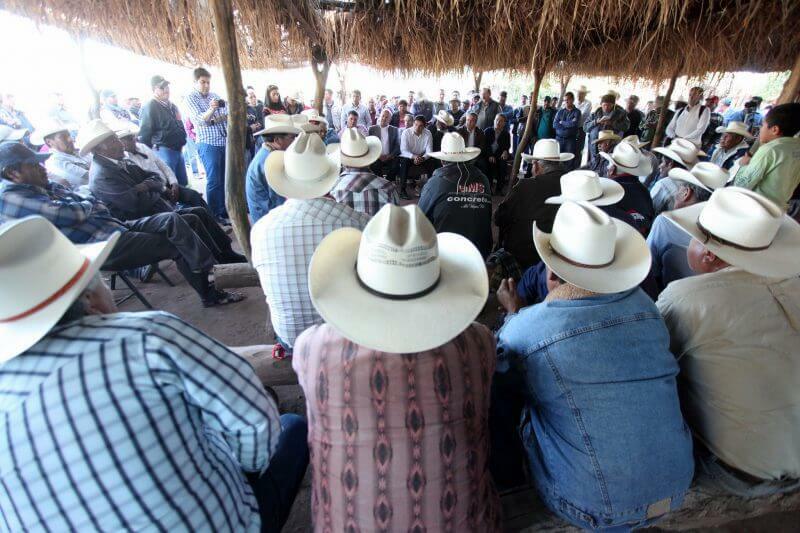 According to journalist Al-Dabi Olvera, members of the Yaqui community in Loma de Bácum haved filed complaints with the Mexican Commission on Human Rights and the Inter-American Court of Human Rights. Last month, Gema Villela Valenzuela reported that members of the Yaqui community are still receiving threats for opposing the pipeline. This article was originally published at Global Voices. It has been edited and re-published at IC under a Creative Commons License.